During the nearly six years that The Knight Shift has been blogging the exploits and ideas of its eclectic proprietor, I've chronicled a lot of interesting topics. This next one easily ranks up there among the more fulfilling things that I've had the pleasure of writing about. And I can't help but feel like I came away from this with not only newly-found appreciation and respect for brothers and sisters in our Lord that I might otherwise have never had fellowship with, but also a deepened and even more profound grasp - however inadequate it must always be so long as I persist in this carnal realm - of what it means to be a follower of Christ. Along the course of my travels I have visited many a place of worship: from every flavor of Baptist church to (accidentally) walking into a sanctuary of snake handlers. And everything in between from Catholic to Mormon, to a Jewish synagogue once upon a time. As a professional journalist I was even once sent to report on a gathering of pagan worshipers. But it's been all too rare that I've taken the opportunity to meet in fellowship with other Christians and not as a detached observer but as one who comes also seeking after our Lord and Savior. So it is that a few days ago, I was invited to attend a Sabbath worship service at a Seventh-day Adventist congregation. Up 'til now, my knowledge of Seventh-day Adventism has been unusually cursory: I understood that Adventists worship on Saturday instead of Sunday. That was basically it, other than I've long known that Adventists discourage the use of alcohol and tobacco (how I came to know that is a whole 'nother story). But over the course of two days I came to learn and understand a great deal more about those of my fellow servants known as Seventh-day Adventists. "The beneficent Creator, after the six days of Creation, rested on the seventh day and instituted the Sabbath for all people as a memorial of Creation. The fourth commandment of God's unchangeable law requires the observance of this seventh-day Sabbath as the day of rest, worship, and ministry in harmony with the teaching and practice of Jesus, the Lord of the Sabbath. The Sabbath is a day of delightful communion with God and one another. It is a symbol of our redemption in Christ, a sign of our sanctification, a token of our allegiance, and a foretaste of our eternal future in God's kingdom." I would soon come to realize that this not only pertains to congregational worship, but also that for Adventists the Sabbath is a very personal time of individual rest from labor and reflection upon Christ. Indeed, I found that the Adventist perspective of the Sabbath to be exceptionally sincere and... perhaps "refreshing" is the most appropriate word? For the Seventh-day Adventist, to be a Christian can not possibly be a matter of mere "religion". It is a pursuit of Christ for every waking moment of life, seeking with great zeal to serve Him first of all and then a service of others as He also served us first. I have to say that in that regard, my own heart came to feel considerable kinship with my Adventist brethren. Seventh-day Adventists hold in high regard Ellen G. White: a Christian writer of the nineteenth century and early 1900s, described by Randall Balmer as "one of the more important and colorful figures in the history of American religion". Which I feel obliged to address something here, and this is coming strictly as one who isn't a Seventh-day Adventist and is trying to be as objective as I can possibly be: Adventists do not worship Ellen G. White! I've found a lot of material floating around on the Intertubes insisting that Adventists hold up White on par with Jesus Himself, that Adventists are baptized into Ellen G. White, etc. During my visit with one particular Seventh-day Adventist congregation, which included a lot of time studying Adventist writings and doctrines in their library, I couldn't find anything remotely suggesting such a notion. I did however study much of White's own writings. And maybe I'm missing something, but from what I've seen she was a remarkably humble woman who did nothing to exalt herself (I was looking for such a thing, trust me) and instead did everything to ponder and meditate upon the glory of God. According to Adventist history, White had only a third-grade education, and yet I found her articulation to be on par with that of Martin Luther and John Wesley... and I can't recall anyone accusing Lutherans or Methodists of worshiping those guys (okay, some people do come to mind, but they're talked about on this blog too much already). The Seventh-day Adventists are among the most Berean-minded followers of Christ that I have had the pleasure of meeting. The central tenet of their faith is "The Bible, and the Bible alone", and to this they strive utterly to hold true. Baptism is by immersion, and for those who profess belief in Jesus Christ (i.e. not "baptismal regeneration"). 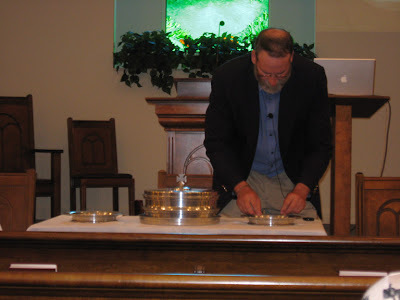 Adventists also practice an open communion, and observe the ordinance of foot-washing. During my visit I was able to witness both of these. The subject was the Second Epistle of John in the New Testament. And it wasn't merely a time of teaching but also lively discussion among just about everyone in attendance. How lively? At one point Pastor Edwards used the Borg from Star Trek as a metaphor for Gnosticism! During this time, I saw husbands and wives pray together and confess to each other their failings, their unworthiness, and ultimately their thankfulness to God for His grace. It was a very moving fifteen minutes, and I am grateful for the opportunity to have been able to witness this throughout the church. Following the foot-washing (and subsequent hand-washing... just want to be thorough in my reporting here folks :-) the congregation returned to the sanctuary for communion. I also found this to be very much like the communion that I have taken in many of the churches that I have visited over the years. Pastor Edwards spoke a prayer of thanksgiving and blessing, and then the church's deacons distributed the elements to us. Following our partaking of communion together, Pastor Edwards encouraged everyone to have a good and restful Sabbath. Some of the congregants then left for home. However many remained and enjoyed a potluck lunch in the church's fellowship hall (I am also told that potluck dinners are very much a tradition following worship services at Seventh-day Adventist churches). According to recent figures, Seventh-day Adventism is one of the fastest-growing denominations of Christianity not only in the United States, but throughout the world. Based on what I have recently seen firsthand, I can understand why that would be. During my visit with the Adventists, I saw a very real and sincere hunger for Christ that... and I am disheartened to say this... is all too absent in our world. For the Adventist, it is about Christ and diligently searching the Word of God for guidance and wisdom. In a day when so much of modern Christianity seems to follow fleeting fads and fading fashion, what I discovered in the Seventh-day Adventist church was very much the same love of God and love toward one another that has endured twenty centuries of man's history and fallen nature. For the many who are growing tired of illusion, there is something very appealing to be found in the Seventh-day Adventist understanding. I am extremely thankful to Pastor Jonathan Edwards and everyone in the family of the Wilson First Seventh-day Adventist Church of Wilson, North Carolina for the opportunity to observe, ask questions and photograph their worship service. It was a very enjoyable and uplifting visit, and I cannot but remark that I feel that God richly blessed my time with them enough that I went away all the better for it. I am a SDA. It is one of the best articles from someone who is not SDA that I have read especially about what we honestly believe example: that we really don't worship E.G. White. I'm also glad that you got to participate in communion. I will be forwarding your article along to many other people. Thank you for writing this! God bless. You are welcome back any time Sir Knight! I'm not an Adventist Chris but I know lots of them here (Michigan) and they are some of the most devout and upstanding people you can meet. This is a great report and I'll send it around to others. Thanks so much for visiting with us! It has been a privilege to begin to get to know you. Know we all enjoyed your visit and you are welcome anytime! God's richest blessings, grace and peace to you! Hi Chris! I was forwarded this blog by my dear foster parents who are SDA's. I have always loved this particular faith - they are very biblical and Ellen White was an amazing woman! I am not SDA, and don't completely agree with some of their teachings, but the absolute main point is Christ and Him glorified - which IS the point! I really like your writing style. I will be praying for you to turn your life back over to Christ, Chris. He truly is the only thing in the universe that satfisfies. Take care. I was raised an SDA, never went to public school, but sorta lost my way when some very terrible things happened in my life for which I had no answers, and there was no reason for them. However, as the disciples said to Jesus, when He asked, "Will ye also go away?" They answered, "Master, where would we go?" And, that's the way I feel. This is an excellent article and I have a very wonderful friend with whom I'd like to share, but don't quite know how. I've told him of the Sabbath, but he wanted to get answers from his pastors (2 of them), who corroborated everything I told him, still he attends church on Sunday. Pray that this wonderful man will see the light and accept it. Perhaps, if I "let my light shine a little more?" Great article, I'll be printing it off and forwarding, thanks. 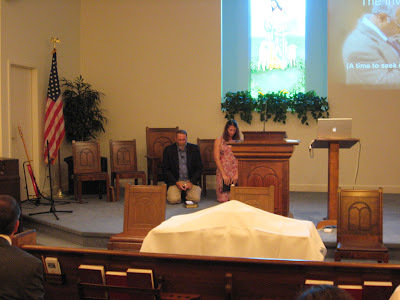 Looks like a pretty high tech church, the pastor has a mac book on the podium and they have a desktop pc computer helping out while they conduct footwashing. I love it. I'm an Adventist pastor and very glad to read of your participation and experience at church. Try out their potluck sometime, bet it's pretty good. Thank you so much for your unbiased view. I just became a member of Hastings 7th day Adventist and I encourage all peoples to truly search your heart for what God has meant us to be. This church is living it daily. We do not attend Church one day a week at OUR choice to "go thru the motions" nor to fulfill the "quota". It is a requirement of God as a believer. REMEMBER, to keep the SABBATH HOLY. It does not fulfill an "emotional" uplifting but speaks to your heart the truth! Ask God to open your mind and lay upon your heart, with the help of the holy spirit, the visiion of a life that we were meant to live. Come and visit a 7th Day church "see" for yourself. Hi,God bless you..you can write give your time to share with others search more about this believe...it is as a family with differences in personality ..few disagree but in the table we all love each others we all love Jesus,and praise our Lord..
Chris, what a GREAT experience you shared with us . . . visiting this Adventist Church! and unbiased. I was raised Adventist and appreciate that you saw "Jesus" in the entire worship experience . . . that is why we attend church. May God bless you with His continued presence! we will be sharing this with others too. We invite you to join us in worship if you are ever in Surprise, Arizona @ the Y.E.S. Adventist Fellowship - our potlucks are the 2nd Sabbath of each month. (Surprise,AZ is a suburb of Phoenix,AZ) visit us @ yeshecares.org. Enjoyed your article Chris. I've been an active member in the SDA church for almost 10 years now. I too have never read anything in E.G.White's writings that attempts to take glory away from Jesus. Instead I've read again and again where she points people to Jesus and to the Word of God. With SDA's keeping the Sabbath, I believe that Revelation 12:17 is ever applicable to the many attempts to malign the SDA faith and EGW's writings. Thank you for your objective perspective. It was both affirming and refreshing. Blessings to you! I am a convert to the Adventist faith. I feel that the book Desire of Ages on the life of Christ speeks the experience I had at my conversion. I appreciate the blog since so much negative things are written which have no resemblance to truth about the faith of Adventist. I have to say that the most important work is to keep focus on Jesus and not the church. If I find a church that teaches closer doctrine to the holy Bible than Adventist I will attend there. In forty years since I accepted Jesus I have never found a church that follows the Bible closer than Adventist. Some churches tell their members NOT to learn what other churches teach. This is a trick of Satan's because he wants to keep people uninformed. Glad you had a great experience! What's keeping you from joining? May God bless you abundantly and His Spirit live deep, deep within your heart and mind, ever drawing you closer to Him and filling you with joy. I loved this article and I appreciate your blogging about your visit! I am a 7th-Day Adventist and I have been off and on all of my life. I am here to stay as I believe the doctrines are exactly what Christ wants us to believe. The greatist commandment is LOVE love God and love your fellow man. If we could all get this one thing straight the world would be a much better place! Thank you again and God Bless and Keep you! Someone just sent me your blogsite. This is a very refreshing article. I have bookmarked it so I can follow your thoughts, etc.in the future. You are fair and unbiased. Thank you! I found the contrast between the SDA church post and your May 11 post about Tyler Frost very different in how the two religions approach their understanding of God. I like your style of reporting, clean, clear and detailed. As an SDA I will say we are not without our "issues" and hopefully we are all growing in our understand of and love for Christ God. I was sent the link to your blog site and enjoyed your review. Praise God that you had such a positive experience and enjoyed worshiping with fellow believers. May God continue to guide you and bless you in your walk with Him. My prayer is that as an SDA Christian I too may show whoever walks in the door of my church a Christ centered love that encompasses all and draws them ever nearer to him. It was very exciting and uplifting to see your blog and I'd like to commend you for your open minded observations and reporting of the Seventh Day Adventist Church. God IS pouring out His Holy Spirit throughout the entire world in these last days. I hope that you will visit again and again in the future. My I suggest a link that I think you will enjoy thorougly, as much as I do? Live services online every Sabbath, as well as archived services from the past. forestlakechurch.org May God continue working in your life and blessing you with His undying love. Thank you. Thank you for you well written and open-minded article!! Thank you for your observations. I love that you emphasize Sabbath and not Saturday worship. So true. Thank you Chris for your generous blog on the SDA church. May GOD continue to bless you as you journey through life with opinions that up life the human race and open our eyes to why we are here “but to serve HIM”. Speaking as a lifetime SDA (and PK), I am amazed on how much "write-on" your article was in explaining the Adventist Church. For extra income, I was a Presbyterian teacher for 10 years and never got used to calling it "Sunday" School but the two-year olds sure looked puzzled when I would say it was time for "Sabbath" School! Your comments were heart warming. Some readers may be interested in the Seventh-day Adventist Church official website at www.adventist.org. I truly love the way my church shares God's love. Very interesting indeed! Kind of a "FOXy" report, fair and balanced! Last summer I did a sabbatical research project and visited 70 SDA churches around the country and am in the process of writing a book about the journey. I found what you found in a wide variety of settings and packages. Thanks for the positive feedback. God brought me to this Faith while I was young that believes and follows the Bible only. I Praise God daily that in His Great Love He gave us humans The Spirit of Prophecy thru His Servant Ellen White. I pray that ALL PEOPLE of the earth will come to know, appreciate and understand that the Sabbath and the writings of Mrs. White are God's Wonderful gifts to all Mankind Thanks for the Outstanding, Remarkable Article of Excellent Writing. God Bless. I am convert to SDA. I think I can safely say that if it had not been for SDA Christians I would still be an Atheist. They are a very kind and forgiving people in general. I must say it is truely refreshing to hear an unbiased view of the SDA faith. It is difficult to explain to people without a real interest in the faith that we do not worship Ellen White. You have so eloquently explained about Sabbath worship as opposed to Saturday worship. I thank you and pray that God will continue to use you and that you will continue to let Him. It’s amazing that you found out quite a lot. I’m an SDA and don’t feel so worthy of being described as what you wrote. I’m glad you were able to see beyond our flaws. I think we all strive to be more like Jesus. It is great to hear that you have a growing relationship with the Savior. Hey Chris, i'm a Seventh-day Adventist from the UK. I'd love to hear what's happened with you since you wrote this article - have you visited again? I agree with someone's comment further up the page that we're not perfect, but by God's grace, he will continue to work on us so that we may more reflect His character. Loved your unabiased article. Concerned that some of the people making comments felt like you had to join the church, 'see the truth', or otherwise become part of them in order to be whole. We are all whole in Christ regardless of what affiliation we have. Perfectly imperfect we all are and I wish the toxic mentality of needing to have someone 'join' the SDA church in order to be right with God would disappear. Over forty years ago my Dad pastored that congregation (Wilson Seventh-day Adventist Church). I was baptized into that church at age eleven (though it was a previous building) and participated in my first communion service with that congregation! Now I train Seventh-day Adventist pastors and members throughout the northwestern US. What a blessing to know they are still letting their light shine in Wilson, NC! Matthew 5:13. This article was forwarded to me by a friend, and I have to say, I began to read with great trepidation. I have received some pretty scary (and might I add false!) articles about my religion before. (We're a cult, worship EGW, same as the branch dividians, etc) But I was so pleasantly surprised to read yours. I really appreciated your glowing review and kind words! Thank you so much for doing your research and reporting the truth about our religion. As others have mentioned, we are by no means perfect, but I think as a religion we have an excellent understanding of the will of God. I hope you will consider visiting that church again in the future, it sounds like a lovely place. Hello Chris. Reading your blog made me feel like I was in my own church! If you are ever out California way, stop in at the Downey SDA church. You'll feel right at home. I am so thankful you enjoyed your time at one of our churches. Did you also know Seventh-day Adventists are some of the longest living people in the world because of our health message? We were highlighted in National Geographic, US News and World Report, Operah Winfrey, and the book "Blue Zones"
Thank you Chris, Your article has given me a renewed faith that The Lord is working on the hearts of many who are not Seventh-day Adventists to give a true account of what we believe. There are many out there that will only believe what is written by non-Adventists. Thank you for sharing your honest and may I say accurate review. Loved your unabiased article. Concerned that some of the people making comments felt like you had to join the church, 'see the truth', or otherwise become part of them in order to be whole. We are all whole in Christ regardless of what affiliation we have. Perfectly imperfect we all are and I wish the toxic mentality of needing to have someone 'join' the SDA church in order to be right with God would disappear. My response: Dear Friend, I understand your thoughts as I hear them often. Please keep in mind that the SDA Church is a "movement" which we feel the Bible predicted would take place at the end of time. As a people we attempt to "lovingly" present Christ to the unchurched and via the Holy Spirit, present correctable errors which exist in churches today. We have only love for all and wish the best to sincere earnest fellow believers. We feel as sincere about presenting our beliefs which are different to you as all Christians do in lifting up Jesus as the only way to salvation. It is not that we are picky or think we are better than you or anyone else. It is the prayer of all SDAs that others would realize we promote our faith because it is based on Scripture and not tradition or emotion. Chris, wonderful, wonderful article. Probably the most Spirit inspired rendering of our denomination I have ever read! And, yes, I too hope you will someday join our movement to prepare the world for Jesus' soon return!! I am a student at one of "our" SDA universities...I've been raised an SDA and have gone to SDA schools my entire life. At the time in my life where I'm truly beginning to rub shoulders with the world and other beliefs, questions and faith are sure to shake the foundation that was laid. Judgements, prejudices, politics and drama all have permeated my view of Adventists from the inside out so much so that it's very refreshing to hear of someone's view of us from the outside looking in. Every church has their problems, as do all denominations, but it's really great to read a report like this from someone who actually took the time to look below the surface. OH MY! If articles like this keeping showing up, the SDA's may lose their "cult"status with the non-SDA people. HAH! So be it. I grow weary of telling people the SDA church could not possibly fit the category of 'cult' with about 100 hospitals and 60 + universities world wide. Greetings and thanks from Monroe, WI SDA church for an open minded and very well written article. P.S. We do not believe one MUST be SDA to be saved. Many current members speak of being led by a powerful force to walk forward and testify faith in Jesus while members of other faiths. I myself am one. I was touched by God while still in a (gasp) Sunday school church. The SDA message came almost 15 years later. Chris you couldn't have given Adventists a better review if you tried. Every nail was hit squarely on the head. Kudos to you. I have been a SDA off and on most of my life and times that I was off was when I wasn't truly connected up to my heavenly Father and the world was a distraction. But there is nothing that will keep me back now, and you are more than warmly invited to join us. We would love to share your love of Jesus with you in our family! Isn't Jesus our Sabbath? The Bible in Colossians 2:16,17 says that all the various kinds of Sabbaths; yearly/season (festivals), monthly (New Moon), and weekly, are ALL SHADOWS of Christ. People didn't even start keeping the seventh-day Sabbath until 430 years after Abraham (Galatians 3:17-19) and then it was to be only until Jesus came the first time. Moses told Israel that this covenant (the law - including the 10 commandments) was ONLY made with Israel (see Deuteronomy 5) "The Lord did not make this covenant with our fathers, but with us..." verse 3. Also notice Deuteronomy 4:13. The Sabbath was a SIGN of that covenant between God and Israel (Exodus 31:13). When Jesus came the first time, that covenant became obsolete (Hebrews 8:13). Jesus brought in a whole new covenant (the word testament means covenant) (Hebrews 9:15-17). Dianne, the Sabbath was instituted at Creation. it wasnt called the Sabbath but in Genesis 2 it is clear that the 7th day in Creation is the Same 7th day described in the 4th commandment. Exodus 16, BEFORE Mt Sinai (where Moses recieved the commandments written by the FINGER of God), God proclaims the 7th day as being the Sabbath unto the Lord. alot of people mix all the Sabbaths together. there are feast Sabbaths as told in leviticus 23. but the 7th day Sabbath had NO ceremony attatched to it. the feast sabbaths did have a ceremony and sacrifice. the ceremonial law was nailed to the cross (the handwriting of ordinances) there were two laws given on mt sinai. One that already existed the moral law,(written in stone by Gods own finger) ten commandments, and the handwritten law of Moses given by God. sin is the transgression of the law. when cain killed able. what did God say to him? "sin lieth at your door" obviously there was a law. murder along with adultery (joseph and potiphers wife incident) were mention before the 10 commandments were written on stone. Gods poeple just came out of slavery, living in a pagan rich world. God wasn't giving them new commandments. but He was REteaching them what His ways were. why would GOd ask them to remember something they never knew. i struggled with this too, b ut i realized they are 10 commandments of God, not 10 suggestions or recommendations. The Holy Spirit leads us into all truth. if we are open to His will, we will come to the truth if we seek it with all our hearts. May God bless you and i hope this helps a little in seeing the differences. if not, just check out the origin of Sunday worship. and the origin of Sabbath worship. you will find your answers there for sure. Great article. I know Pastor Edwards personally and he is a true servant of Christ. Thanks for the non-biased article and giving us Adventists a fair shake. we love Christ and Christ alone. EGW was a great servant and she only intended to point to Him, nothing more! Thanks for your blog! I too was shock when I first found out how great Adventists were. And their teachings are so biblical. I love that they preach from the Bible! I found that the Colossians texts were talking about being saved by faith not works, not being condemned by a fellow man or condemning a fellow man. Also that the laws and traditions are representations (shadows) of what is real and much greater in heaven. I don't see how this makes them less important, rather adds value to them. Genesis 2:1-3 is the first mention of keeping of the seventh day sabbath. Also it is my understanding, by reading the texts you gave and those around them, that the covenant made with Israel was not the law but a promise (If they kept the law they would live prosperously and multiply in the promised land.) Also, that the writing down of the law was required because of their transgressions, which would imply that they have broken laws that were already understood (the written law was to clarify and emphasize the most important). Yes the Israelites were to keep the Sabbath in remembrance of being delivered from Egypt - Deuteronomy. And in remembrance of creation - Exodus. I believe this makes the day doubly important. I like to think of the sabbath also as my day to remember being brought out of sin and the promise of heaven (parallel significance to the Israelites' covenant). Regarding the old and new covenants talked about in Hebrews: Old covenant is the law written in stone and the promise of the land flowing with milk and honey. New covenant is the law written on our hearts and minds and the promise of heaven because of Jesus. Sorry about the bold (don't know how that happened), and the questionable grammar . Chris - thank you for sharing your experiences in the Seventh-Day Adventist Church. I am glad you enjoyed your visit. It is wonderful that you so completely grasped the full scope of the word "Sabbath". The Sabbath Day is a time to rest and reflect and worship the One who created heaven and earth and each one of us. I am an SDA believer. I did, however. belong to a few other churches along the way. Having experienced it, I am confident that God will lead us where he wants us to arrive. Not every trip is the same - but if we sincerely seek him and ask the Holy Spirit to guide our paths, we will be lead. Everyone has their own jouney to take. I would not have wanted to be lead any other way -- I have learned much from each fellowship experience. I do believe that keeping the Sabbath is an expression (a testimony, if you will) to our belief that God is our Creator. It is a very special time. Someone told me that scientific tests have verified that the body actually slows down during Sabbath hours. It would be an interesting topic for you to research for us. I have not done the research myself so cannot attest to whether that is true or not -- except, I certainly know that after a good Sabbath potluck it is nice to rest. Sabbath is also a day of blessing others -- with our time and a listening ear and sometimes even a little musical ministry. Happy Sabbath to you -- yes, it is Friday evening :) May God continue to bless you and keep you in His watch care. I was converted to be a Seventh-day Adventist Christian from a traditional Chinese belief in 1981. I keep studying the Bible since then and find that the SDA church teachings are based on the Bible. In 1997 we had an evangelistic meeting and a few people were baptized. Some of the new converts said that they used to think the SDA church as a cult, but after listening to the sermons, they concluded that they were all based on the Bible. In response to Dianne's comments, I would like to say that there are 2 kinds of Sabbath, the Seventh-day Sabbath (Genesis 2:1-3 and Exodus 20:8-11) and the ceremonial Sabbath (Leviticus 23) that the Apostle Paul referred to in Colossians 2:16-17. The ceremonial Sabbath did not necessarily fall on the seventh day, and it was performed on the temple with food and animal sacrifice as an atonement for their sins. When Jesus died on the cross, the ceremonial Sabbath was done away with; the curtain on the temple was torn in two from top to bottom (Matthew 27:51) to show that we Christians do not need to observe the ceremonial law anymore. Looking to the future when His followers would be persecuted, Jesus said in Matthew 24:20 "Pray that your flight will not take place in winter or on the Sabbath". His statement shows that Jesus still wants His followers to keep the Seventh-day Sabbath as He did while He was on this earth (Luke 4:16). When we read the writings of the Apostle Paul, we must know the context and the background. The Apostle Peter gave his comment on Paul's writings in 2 Peter 3:15-16 "Bear in mind that our Lord's patience means salvation, just as our dear brother Paul also wrote you with the wisdom that God gave him. He writes the say way in all his letters, speaking in them of these matters. His letters contain some things that are hard to understand, which ignorant and unstable people distort, as they do the other Scriptures, to their own destruction". If you still have any question, I suggest that you contact an SDA Pastor near where you live and study with him what has been nailed to the cross and what stays. Let's study the Bible with the only intention to know the truth and God's purpose for our life. I would like to emphasize that keeping the true Sabbath does not save us as we are saved by God's grace and Christ's sacrifice on our behalf. We keep the Sabbath because we love God (John 14:15) and not to earn salvation. Our salvation is by grace and not by our works (Ephesians 2:8-9). For those interested in when the Sunday day of worship came about, study Bible history, search during Constantine's time. Great to see such a positive experience for Chris! I too have had similar experience in the Seventh-day Adventist Church. Thank you for a very balanced view of what I wish I could have written. To live as Christ desires us to live, we must be surrendered to the Holy Spirit and we will be led to where God wants us. Repent, surrender, study the Word in the pages of the Bible and pray for guidance. Keep His commandments. May our Lord bless and keep you alway. Great article. I just hope that someone who is unfamiliar with Adventism will realize that the writer had an almost "ideal" experience and that another visitor in another church on a bad day could have an almost opposite time. Adventists are people, and all of us are fallen, and redeemed solely by the blood of Christ. Unfortunately, some of us haven't taken advantage of that blood as much as we should have! ;-) A visitor will find all of the problems of humanity in Adventists that they find in other churches. Just like Jesus said to Nicodemus, "Salvation is of the Jews" which was true and the Jewish people had the truth at that time, but what was the Jewish church like? Just don't expect that every single Adventist or every single Adventist church to be full of sincere, dedicated, unselfish, issue-free people. Wish it was. I really appreciated your unbiased article on the Seventh-day Adventist denomination, of which I am a part. Jesus is the author and finisher of our faith. Pray before you open His Word and He will lead you into all truth. We can trust our Creator/Savior with everything. He loves all of us with an everlasting love, and will never let us down. I find it interesting that God created heavens and earth in six days as mentioned in the first chapter of Genesis. Adam and Eve were created on the sixth day. What made me wondering why we didn’t have six days weekly calendar? Why did God add the seventh day? He didn’t create anything new on that day except that He blessed it and sanctified it. The word sanctify means setting apart for holy use. Obviously, He intended to have this day for holy purpose, that is, to have a close fellowship with Adam and Eve right after they were created. This is truly an act of love He has for the created beings. This was why Jesus said in Mark 2:27, 28 that the Sabbath was intentionally created for man. He further added that He is the Lord of the Sabbath. Throughout the Bible, the Sabbath was often mentioned as the Sabbath of the Lord your God which indicated that it belonged to God given to men. If not for the seventh day being added, Adam and Eve would have been left to ponder how they and the creation came into being. Furthermore, God created seventh day Sabbath before they fell into sin. God intended that the Sabbath was to be celebrated throughout all eternity had Adam and Eve not fallen to sin. Though the heavens and earth had been marred by sin, God promised us new heavens and new earth thus bringing us back to His original creation. He went further to mention that on the new earth, we will worship Him on every Sabbath throughout the eternity as mentioned in Isaiah 66:22, 23. This is truly a delight to worship and glorify God on His own holy Sabbath day He designated for us all. May the God Lord of Host be praise, and may he bless each and every person who has commented on this blog. we thank Him that created the heavens and earth for such small oppitunities in getting to know im better, as you started Chris, with the article "But it's been all too rare that I've taken the opportunity to meet in fellowship with other Christians and not as a detached observer but as one who comes also seeking after our Lord and Savior." you were only seeking the Lord and im glad you found him. blessed week to all my fellow bretherens in Christ as we continue to read this weeks lesson on "The fruit of the Spirit; Meekness"
I respect your unbiased views and find them quite convincing. I thank God that He has placed so much good in the worst of us that His light can shine through to any one who looks objectively for truth.God bless you for writing in this sincere way. When you visit Jamaica, you will find sand, sea, sun and warm welcoming SDAs. Chris, a friend just send me your link, and after reading it, I felt almost if I was reading it on a Sabbath afternoon. It is amazing, but you have captured much of our ethos in that article. Seventh-day Adventism is making a significant christian impact on peoples lives around the world. Here in Jamaica, where I live, there are over 250,000 Seventh -day Adventists in a population of 2.8 million. We maintain a university with total under graduate and post graduate enrollment of over 6000 students. It is amazing what God can do with and through us, once we commit ourselves to him. Thanks for an objective review. I will certanly be passing your link on . Thanks for the very inspiring comments. I'm a guy at my early twenties and always get attracted talking about religion and spirituality. I've found this blog 'cause someone had posted it in a certain "question and answer" site. I'm an SDA member for almost 12 years now and when I read your post here and I thought of sharing it to somebody else who had negative impression with SDA's. I had just decided to stop asking questions to the one who claimed himself as an "expert" in SDA doctrines and beliefs although he is not an SDA member because I've found it useless to continue on discussing with him. I'm afraid that a soul would be tricked of his arguments but I just praise God that a non-Adventist believer has witnessed the truth and the love of God in SDA church here on the net. A million thanks and I'll be sharing this to others as well. God bless you together with your family circle! I was given the link to your blog by someone just today and found that I really enjoyed what you have written. I have been a Seventh Day Adventist since birth and it is so nice to hear your positive and uplifting remarks. You definitely "saw" Jesus that day, manifested in the good folks of the church you attended. May God richly bless you! Wow, Cris, I really appreciated your report. We attend a small country church in CA and only have regular potluck 1st and Haystack potluck on 3rd Sabbath. Our church also has EArly prayer group and a healthy delicious breakfast before Sabbath School. What I like best about being SDA is how everyone helps out when there is trouble. ADRA and a number of private groups for the big stuff like Haiti. When my son had his face kicked in by a horse, when a drunk driver destroyed our business's equipment, when there has been sickness or trouble, there also have been our local church friends. For all the SDAs reading this, thanks for the caring. What a beautiful article! Thank you for sharing about your experience. There are so many negative things about Seventh-Day Adventists on the the Internet & elsewhere. It's very discouraging. But your article, coming from a non-Adventist, is REFRESHING! I was raised in the Adventist church. I love this church. My husband is an associate pastor in the church. It has been a great blessing to be involved in ministry for Christ & to have had the opportunity of a Christian family & a Christian education. May God be with you on your journey. May God bless you beyond what you could ask or think. It is rather comforting and interesting to know that persons are still in search of the Bible Truth. I am convinced that there is still hope for our future. I am happy to know that you enjoyed the service and felt the Spirit of God among His people. Jesus is coming soon, Let us prepare to meet Him. Hey Chris have you seen the statistics also tht SDAs outlive their peers by 10 years..google it big findings in the USA. This is due to their health teachings and the fellowship tht u exeperienced. Hello Knight Shift, I just got this mail and I stopped my activities to read your 'report' thoroughly. Whenever you can, do visit us in Jamaica and particularly the Kencot SDA church, 10 - 12 Osbourne Road. I promise you that you will be "blessed more than you could ask or imagine." It's wonderful to hear when persons have such impressionable experiences.To God be the Glory great things He has done and continues to do!! Chris,may you continue to know God and trust in Him!! Chris, Welcome to the call to holiness from the Creator who imparts it. Many prayers are with you including Christ's prayers who is leading you. Hi Chris,. Thank you for allowing yourself to be used as an instrument in God's hand.I pray though, that what you have found will inspire you to obedience. In our ignorance, God winks, but when we receive knowledge we have no excuse. I know God led you to this and I am confident that He who began a good work in you is faithful to continue Phil:6. God is blessing you. Anne. NW Houston SDA Spring TX. Hi Chris! I'm a fourth-generation Adventist, and I commend you for keeping an open mind. Continue to stay close to Jesus. He's our best Friend, you know, and He will guide you in all your decisions. You are precious in His sight. You will be in my daily prayers. This article is very uplifting, I commend those Brothers and Sisters for allowing God to lead them in showing the right example of love and kindness to a none member. God bless you all! What a breath of fresh air to have read your article! Having grown up as an SDA, I want to thank you for taking the time to find out who SDA'S are! When those writing comments here ask you to 'join' them; they are asking you to join a family, not a religion. We welcome all of God's children in our mist and feel it is our mission to spread the good news of our Lord. In these troubled times, it is wonderful to understand God's Word. It replaces fear with joy, knowing these are signs of His promises being fulfilled. His promise to reclaim this world and His children. It provides a peace that passes understanding. If you look further, you will find SDA's have hospitals, universities and schools all over the world. They are used to spread the wonderful news of our Lord and tend to His children. Chris, may God continue to bless you. You brought back comforting memories to me in this article. Thanks Chris for the unbiased and honest account of your experience. I'm sure there are SDA Churches where you might have had a more negative experience, but that's true for any denomination, anywhere. The way a church worships expresses their beliefs concerning the character of God, so what you witnesses is an expression of that congregation's perception of God. For Dianne: A covenant is a legal agreement between two or more parties. It will have terms, promises and a method of ratification, or a way of making it legal. The terms of the Old Covenant were, obey the Ten Commandments and live forever. It was the Israelite's, who made the promise to keep them and it was ratified or made legal, by the shedding of the blood of animals. The New Covenant has the same terms, obey the Ten Commandments and live forever, but this time He(God) writes them on our hearts. The Old Covenant was faulty because the Israelites made promises, which they couldn't keep. Heb. 8:6-10. The New Covenant is "better," established on "better promises." This time, God makes the promise to help them obey and, this New Covenant is not ratified by the blood of animals, but by the blood of our Savior, Jesus Christ. So, the New Covenant does not do away with the Ten commandments, or the 7th day Sabbath. The Sabbath was given to all humanity at the creation of the world, long before the Jewish nation existed. Today, God writes those commandments on our hearts, through the power of the Holy Spirit. Isn't it true that all Christians strive to live by the commandments; only the Sabbath commandment is problematic, most likely because of misunderstanding the Biblical teaching concerning the Old and New Covenants. I pray this will help a little. May God bless you Dianne, as you continue to study and seek Bible truth. and practise the same to the public. Before I became a 7th Day Adventist I had a very bad experience with one. When I heard truth however, I could not resist the call. It's not about the members, its about the message. Of course this does not mean members should not live up to the standards of the church, but unfortunately not all do. For all individuals who truly want to serve the Lord, the SDA church is a wonderful start here on earth. I'm a fourth generation Seventh-day Adventist--and a pastor, as well. It is rather refreshing to look in the mirror of another Christian's eyes and get a look at what one can come to take for granted. Every where I went, whether it was to a conservative Mennonite congregation where the men sat on one side and the ladies on the other, and they sang without musical instruments, to a high church Catholic congregation where I learned to cross my arms and get the "blessing of Christ" rather than the "body of Christ" at the Mass, I found wonderful Christian people doing the best they knew to love God and serve man in Jesus' name. I was greatly blessed in congregations as wide-ranging as Baptists, Pentecostal, Latter-day Saints, Jehovah's Witness, and even a Buddhist temple that meets regularly on Sundays to parallel American culture. God has good people everywhere. I found them every place I visited. 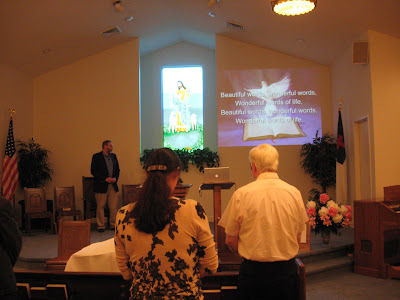 Most recently, I had a chance to visit in a small Seventh-day Baptist congregation near where I now live in Connecticut. I always wished to return there and thank them for pointing out the Biblical teaching of the seventh day Sabbath to the early founders of our denomination. It was Sarah Oaks, a Seventh-day Baptist, who first shared this particular Bible truth with us. Nearly all our doctrines were mined from God's Word by those who went before us. We owe a great debt to many. I did not grow up Adventist, but I am now. I will say that I saw a lot of what you noticed when I started attending church with my then boyfriend, now husband. I went to quite a few Sunday churches before trying this one. I have never seen a church where the people actually have a relationship with God like this one... it always seemed so superficial to me. I will say that at first the Sabbath was overwhelming to me, thinking of all the wordly things I was missing. Now I see it for the true blessing it is and refuse to let anything interfere with it. Thanks for your portrayal of our church. I plan to forward it to our non-SDA friends in hopes that it helps them to understand us a bit more and why for that 24 hour time we appear so isolated from the outside world. Chris, Thank you for your article! I was raised Seventh Day Adventist, and while am not actively practicing, I still hold dear the memories of the church and the people. Your article puts into words so eloquently the feeling of communion at a SDA church. In response to all of the comments about Saturday: I think one of the most important parts of being a Seventh Day Adventist is not on the specific day we worship but rather what the day means to us, both as a person in Christ and as an individual. The Sabbath is a day to spend with Christ, family and what He has given to us-to bring us closer both to Him and all that He has made, as well as a day of respite from the world. I feel that what sets SDA's apart instead of when we worship is how we worship. There are very few Christian communities who dedicate a day to the Lord, especially in the modern world. I feel your article brings this into perspective, and I thank you for it. Loved the article. Thank you for your unbiased account of your time with our church. As a child of God saved by grace alone, and a commandment keeper, I believe it is indeed important which day we keep, not to be determined by "what the day means to us". It's not about "us"..it's about what our Creator is asking of us and what He knows to be best for us. Are we willing to follow what He asks? It takes courage, but the Lord is in great supply of that, just for the asking. What a privilege it is to be acquainted with this church, which has a purpose, especially in these days, to spread the good news of Jesus and what He's done for us. Your article was right on the money, thank you. It is difficult at times to witness to others and see the hesitation re: the Sabbath. It's the Holy Spirits' work to touch the heart, we just need to allow Him to work in us. The Sabbath IS about us, in that God made it a special and specific time for us to commune with Him. It's a huge blessing that many don't understand or appreciate. Think of how special Sabbaths will be in heaven, in the presence of God Himself. As a 7th day Adventist I would like to add my thanks to you for your article, we are often accused of all kinds of strange things (even from many who claim to be part of us)and it was refreshing to read of someone who received what we hope everyone would. I really enjoyed your article. So glad your experience was so positive. I also wanted to comment on Christian's comment " pray that your flight will not be on Sabbath." Jesus was talking about the destruction of Jerusalem. The gates to the city were locked on the Sabbath, so nobody could get in or out of the city till after sundown. "And when you see Jerusalem surrounded by armies, then you will know the times of destruction has arrived." Luke 21: 20-24, Matt. 24:15-20. What a really thoughtful and comprehensive article you have written on Seventh-day Adventists. I'm glad you enjoyed your time at this exemplary church. While it's great to find people in a particular church living out the gospel and pleasant to be around, remember, religion is not the people but the message. Adventists are blessed with the message that closely follows the Bible as its roadmap. However, as everywhere, people are human and can fail and let you down. But, the message and the Lord never fail. Thank you for you thoughtful website. I agree with pretty much everyone who took the time to write, a very posative outlook and interesting insights. I also agree with the UK writer and would be curious to see a follow up article. I am (and was raised) a Seventh-Day Adventist. This was a beautifully written, truly educated (through your own experiences!, fully immersed and unbiased article. Thank you visiting one of our sister churches and writing this report. God bless you! Loved your article Chris, thanks. I too have been a life-long SDA as many others have been and appreciated your balanced reporting. Blessings to you Chris. Someone asked why you have not joined the SDA church yourself. Good question to think about. Stumbled on this blog. Interesting. I had my own biases about that church but no real first hand experience. I was surprised and interested as I "saw" it through your eyes. I think I now have to go visit a nearby one here here in the Sacramento area and see if I get the same vibe you received. Thank you for taking time to record your experience. It might change my journey. Chris, are you an angel of the Lord in the flesh or what? Your article was delightful and I would entertain you in either of my two SDA churches or my motorcycle ministry, 3AM (short for 3 Angels' Messengers) ANYTIME. As a matter of fact, when you visit San Antonio, please look me up (Pastor Bill Hunt aka BROTHERMAN)...I would like to share with you my experience with Jesus and conversion into the SDA church while I take you to lunch at an Adventist owned TOTAL vegetarian restaurant. JESUS is AWESOME! He reigns, He loves you and He is coming soon! No, I'm definitely not an angel of any sort. Just a guy who after many struggles found Christ and strives (and often fails) to serve Him to the utmost. And who never ceases to find delight and encouragement from my fellow servants in Him. The thing I like about being a Seventh-day Adventist is that no matter where I go in the world we have a family of believers! Thank-you for making that picture of our church real! Sir, I want to thank you very much for what you said about us in this blog. My pastor emailed me a link to it, and I was thrilled by what I was reading. I cannot begin to tell you how glad I am that someone who is not and SDA is finally writing about the Adventist church from a non-biased perspective. Thank you so much, and may God give you great blessing as you continue to seek His face. Having been raised in this faith, I appreciate the chance to read the unbiased and freely-stated opinions and observations of someone more removed from it. You have, albeit inadvertently, re-confirmed my faith within me, and, for that, I thank you, most sincerely. It is all too easy, in this secular-minded, and hedonistic age, to lose sight, again and again, of TRUTH, which, sad to say, is already a seriously-endangered thing! I do believe that, after observing many, many other religions and their practices, THIS is the only church which would accurately fulfill the description of 'The Remnant' of the very last days, as pointed out in the grand and timely book of Revelation. I wish you every success in your own search for 'truth'. Each day I pray for people like you who, with an open mind, will have an unbiased look into what is really most needed NOW. In those same prayers I contantly present before the Saviour my own beloved birth family, my children, grandchildren, and entire extended family, for they are, after all in serious of 'awakening' before it is forever too late. May God bless you. Thank you, Chris, for your true and kind words of the SDA beliefs. May the Lord bless you and lead you into the truths you seek. You will be in my prayers, and please keep visiting, you will always find the Lord on the Sabbath! Thank you for taking the time to do more than a casual look. I am a fifth generation Seventh-day Adventist, ever seeking to refine and enhance my singe-generation experience. Sometimes it seems all too easy to notice the shortcomings of one’s faith and yes sometimes even others’. Chris, I was moved and inspired by your Christian example. May we always treat others as you have, taking the time to get to know them and presenting them in the best possible light! I admire that Christ-like quality you have demonstrated and would like to emulate that in my Christian walk as well. Clearly God is inspiring, and blessing your life! Praise God! Lead on! Writing from Brisbane, Australia. Whether you believe it or not, your article has richly blessed so many and it comes across clearly that the Holy Spirit was "at your side" as you wrote. May Jesus continue to uphold you in uplifting others by the quality and content of your site. It's a little scary when you find you have been "used" by God to encourage and help folk along life's journey. I pray He will also bless you. Yes, I am a life-long Adventist, and I thank God for the friend who sent us this blog site this morning. Our youngest son (not yet 40) is terminally ill and after two kidney transplants and 30 years of renal problems, cancer has come to harrass him. Without the wonderful support of the world-wide church family, in prayer and hugs, we could never take this walk on our own. God bless you all. Heather. Chris, thank you for your honest and fair-minded assessment of Seventh-day Adventists. You certainly captured what the Sabbath means to us experientially. As for the theology of it, we’re just trying to honor Jesus, who proclaimed Himself Lord of the Sabbath. This includes honoring Him not only as Creator but as Savior. After finishing His work of salvation, He rested on the Sabbath; and today we express our identification and solidarity with His salvation by also entering His rest every Sabbath. Because of all the misunderstanding of Seventh-day Adventists, I set up a website to explain who we really are: www.sda4me.com. It’s been featured in our two magazines, Adventist Review and Adventist World. This summer Adventists from around the world will be coming to Atlanta (June 24 to July 3) for a big convention at the Georgia Dome. That’s not too far from where you live! Please drop in on us for some fellowship. I’ll be editing the daily newsletter for delegates and would love to meet you personally, Chris. BTW, I attended a Baptist seminary and had a great experience as an Adventist there. Truly we who share faith in the Lord Jesus have fellowship in Him that transcends any doctrinal differences. God bless you, Chris, our brother. Assistant to the president in the Mid-America Union of SDA, communication director, editor of Outlook magazine. Thank you my friend for this accurate and uplifting report. We love Jesus very much. And He is the centre of all our beliefs. God is using you to vindicate His name and through it also the name of our church. You really made me curious about Adventists and so I went to the Adventist church that is here in our city. It was small also and I must admit, it was nothing like what I expected. Warm, caring people who seemed to be really into the Bible. They even asked me to stay for lunch, which I guess they do often. Really good food, and all Vegan....amazing. Great meal. I asked if all churches do this and they said, many do. Thanks for your blog, and for opening my eyes to a true Christian experience that was just down the street from me. When creation week was set in place, an All-Wise Creator capped it off with a special day and deemed it good. This day has come at the end of every week since that Week and it will continue to come at the end of the Weeks eternal. As a child, Sabbath had a different “feel” to it from the other days of the week. One might compare Sabbath to having a birthday party. Think of the excitement you feel knowing that you have this great event about to happen. Now multiply that by 52 weeks in the year!) All things of the world were set aside for a 24-hour period so we could fellowship in the Lord without the distractions of the world encroaching on that special time. We would welcome the Sabbath with sundown worship and bid it a fond farewell until the next week with a closing time of family worship as well. The hours in between were golden and special. We had a favorite family lunch and would often find ourselves in nature delighting in what had been created for us to enjoy that, ultimately, glorified God. As an adult, the Sabbath day experience has only deepened as we have expanded what we do in fellowship and it is not uncommon to gather together to study the Bible more in depth. Where we live now, we are afforded an opportunity to visit our local hospital to stroll the hallways and sing hymns of encouragement for those lying on beds of pain and illness. Lives are touched as we go and minister to them through song. This world is spinning out of control. If we had 26 hours a day and 8 days in a week, we'd blow through those as well. And, having all of the electronic gadgets that keep us connected all the time is not always a good thing. God knew we'd need a release valve on the pressure cooker of life. That's one of the reasons He said, "I'll give you six and you give Me one." It's not that He wants to keep us from enjoying life but that He wants us to live life to the fullest. When we are rested, refreshed, relaxed and renewed in Him from spending time in the Oasis of the Week called Sabbath, it is much easier to be "God with skin on to the world." If you feel that the rat race is wearing you out, consider following the invitation set down at the end of creation week and rest in the Lord. Truly rest and be renewed. I invite you to join me in turning off the world for one 24-hour day (yes, this means powering off the electronic gadgets, too). Open the Bible and, not only read what is written, but be fed the manna God has between those sacred pages. Try it once. I guarantee you'll come back for more. As the Bible says in Mark 2:27, "The Sabbath was made for man, not man for the Sabbath." Open this wonderful gift and truly live. Hi Chris, Thank you for this wonderful article! I am a life long SDA and the Sabbath has always been a wonderful time for my family. My father always says, "God planned it just right. If He had made the Sabbath a day earlier, we wouldn't need it and if He had made it a day later, IT WOULD HAVE BEEN TOO LATE!" The Sabbath is a day that we can rest IN Christ. Thanks again for your kind words. Chris, Thanks for your kind permission for our congregation to reprint this article. I have done so, noting your permission, including your copyright information, and also giving your blog URL for people who would like to read more of your writing. We expect to hand out about 700 of the reprints to homes near our church in Willimantic, CT, and mail some to friends and family in the area our members have been praying would attend our Visitor's Sabbath, scheduled for the last Sabbath in March. Your viewpoint could be an encouragement for others to consider a visit of their own. There are so many mainstream articles about the benefits of setting aside spiritual time, slowing down, making time for family and friends and how important it is to guard that precious time. God, the Creator (First Scientist) and loving Father, modeled the behavior at Creation and then wrote, "Remember, the Sabbath day...." It wasn't a BTW in a letter. When God authored His top 10 ways for the best life--the Sabbath was listed at #4 and murder, lying, adultery were lower on the list. When I think about it--The 10 commandments is the WWJD list! Your blog was very refreshing - I was raised an SDA and my father has worked for the church my entire life (he is retired now), so I have known no other religion, so to hear your "outsider" comments just strenghtened my beliefs. If you read your comments, I do want to share this link w/you - on PBS next month they are running a Documentary Film from Jouney Films, different areas may run at different times, but a DVD is now available too - http://www.journeyfilms.com/ - may God bless you as you continue your blogging on this interresting subject. Sounds like most folks are pleased with the fair review. I, too. Keep up the good work, Chris. Wow, what a great read! God bless you continually as His Spirit leads you in life. Thanks for such an unbiased report of your experience worshiping with a Seventh-day Adventist church. I'm a life-long member of this denomination and quite frankly, "Where else would I go" knowing what I know?! I'm also a pastor's wife and find it a joy to share with others the joy of our Lord. What a blessing that you have an open mind when you visit places to let the Lord lead. I was raised Catholic and became SDA after asking God to lead me to a true church --- IF there was one on this earth. I had never even heard of Seventh Day Adventist when I prayed that. Today, I am most thankful for God's loving kindness in leading me to truth and his kindness of bringing this email my way where I could read your blog and be reminded of this. While serving time in Nevada state prison I studied with every main stream religious denomination, but the &th day Adventists were the only group teaching the bible, and the bible only to teach Gods word, I was baptised in 1978 while still in prison, the Lord opened the doors for me 10 years earlier than my minimum release date, and I've served him ever since, I'm the elder in my church in charge of evangelism, and do a weekly radio program with the youth in our church, praise the Lord for his love and mercy, and thanks for your heartfelt article, Jesus isn't here yet, but he's on his way! Hi Chris, I too want to say that I really appreciated your non biased review of the Seventh Day Adventist Church. MyGoodNewsTV.com is on Phoenix Channel 44.3 in Arizona. May God richly bless you as you continue your journey with him. I'd like to welcome you to the City composing the largest Family of SDA's around the world. I'm from Loma Linda, California, considered as location of the largest SDA Church in the whole wide world- the Loma Linda University Church of SDA with 6,500 Church members alone. The city itself is proud to tell you that we are an SDA -oriented city here in Southern California. Loma Linda is about 60 miles east of Los Angeles, CA. Here in our City, non-Adventists are always welcome and can go to any 8 SDA Churches here within our City area alone, namely The L.L.University Church, Campus Hills SDA Church, Azure Hills SDA church, Loma Linda Filipino SDA Church (considered as the largest Filipino Congregation outside the Philippines with 1,000 members. 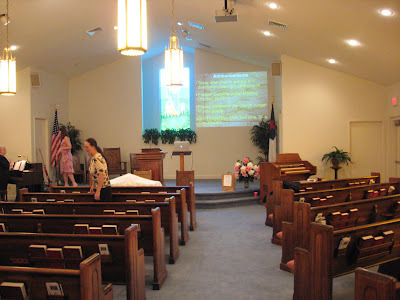 ), Loma Linda Korean SDA Church, Loma Linda Chinese SDA Church, Loma Linda Japanese SDA Church, Loma Linda Indonesian SDA Church, Loma Linda Thai SDA Church, Loma Linda Samoan SDA Church, etc. and a bunch of all small companies/groups of Adventist members. Please Come to Loma Linda and see for yourself how Adventist live happily with healthy lifestyle. Most SDA's are Vegetarians.No doubt, Chris, you want to become an SDA member someday. Thanks for your positive thoughts on us. Rachel Oaks, it is. Thanks for the correction. I have been a SDA for about 26 yrs. I want to thank you for your lovely blog reporting about our church. When I first came to the church, I saw the same thing. I have been in many churches, but none like the SDA. On Easter Sunday there will be a PBS special shown about the Adventist church. I hope that with your blog, others will watch it and see what our church is like. We get so many derogitory comments because we are different. Thank you again for your comments. I will be passing the URL along to many others. I really appreciated this article. Excellent job! One thing I learned since becoming a Seventh-day Adventist is to accept people as they are and to encourage them to be the best they can be. Love them regardless. Everyone, in every faith, has some kind of problem. We are not perfect. But! With God's help, we can overcome. What a nice article. I am SDA and I could not have written a better article. I am very glad that you enjoyed your Sabbath worship and hope that you visit again. of God. May the good Lord richly bless you as you continue your walk with HIM. Hi Chris, why don't you come to Canada as well and visit us at our church in Barrie, Ontario! When you come to Canada, just look for a SEVENTH DAY ADVENTIST CHURCH, you will be taking care off! It's all about knowing Jesus. If you know him, you want to be like him and tell others about the most important message from beginning to end in the bible "His second coming" and he is coming for his children. The question is, are you his child or just another church goer (Sunday or Sunday, it doesn't matter). If you want to know him you must read and study his manual. Sir Knight...The following information may have already been shared as a comment on your blog...for another 'non SDA' view of 'who/what are Adventists?' there will be a new PBS film called “The Adventists,” a one-hour documentary film on Seventh-day Adventists and their unique approach to health and healing, will be shown on PBS stations in April. This is interesting because a non SDA produced the film from start to finish. To learn more visit www.pbs.org or www.journeyfilms.com to find out viewing days and times in your area. To find out more about the film, visit www.theadventiststhefilm.com . has to guide our lives. That is what it all boils down to. To comment on Mely's comment. "The new covenant was written in our hearts." Hebrews 8:7. If the first covenant had been faultless, there would be no need for a second covenant to replace it. I was just wondering if you replace something doesn't that mean you have something new? A real new covenant? Great article! One thing was missing. The second part of the Seventh-day Adventist name, "Adventist". Meaning belief in the literal and actual second coming of Christ to that the redeemed back to heaven. This is the second in important teaching of the Adventist, First is to lead people to Christ our Saviour, and second to help people to be prepared for His second coming. They believe in God the Father, God The Son, and God the Holy Spirit. Thank you for your article. I became an Adventist at the age of 15. I am now 22 years old and I love being a Seventh-Day Adventist christian. I converted to the faith because I was searching for Truth and God led me to this group of believers. It is refreshing to read the truth about our faith from a non-SDA. God bless. Great article. The great center of attraction of the SDA teaching is, Christ and Him Crucified. How very refreshing to read something positive regarding Seventh-day Adventists. I have been a member all of my life and unfortunately most of the things I've read on the Internet are anything but positive. Thank you for your fair unbiased reporting. This article is such a blessing to both SDA and non-SDA readers. Thank you for allowing the Lord to use you in such a powerful way. Chris, your article was so uplifting and on point. The only way you could experience what you did was becauses God was showing you things about the Seventh-day Adventist Church so that you could correct the misunderstandings of so many. God has used you as a instrument to spread the truth about our denomination and I thank you for allowing Him to guide you in your writings. Continue to be led by Him. He has great plans for you. If you're ever in New York City, feel free to visit the Lebanon Seventh-day Adventist Church in Queens. We're about 3 miles from JFK airport and we would be delighted to have you join us as we worship our Creator every Sabbath. If you are looking for a friendly small quaint church in the Sacramento area Meadow Vista SDA is a jackpot. If you are looking for a larger congregation Granite Bay SDA church is the one to go to. I am a Presbyterian married to a Seventh Day Adventist. I attend Church with my wife and appreciate your view as another visitor to the SDA Church. I've been a Christian for years, but have learned much and become closer to God, partly from my experience with my SDA Christian cousins. As I quit debating the Sabbath vs Sunday argument and focus on listening to God as he speaks to me, I realize the whole debate was just a stumbling block for me. I thank God for all the wonderful ways he speaks to his people--regardless of the denomination or church they are attending. Please Father, help me hear your voice in whatever way you are speaking to me. Amen. Chris, digging deeper, you will find that the reason the power of God blesses the SDA movement so greatly because they understand the importance of PROPHECY as it relates to God's authority. (Isaiah 41, 44, & 46; also Luke 24) Christ called His own disciples fools for not knowing prophecy. The biggest problem/s I have found in the various churches I have attended is how they turn the Bible into a tossed salad (rearranging the sequence of events as written) and/or diverging from scripture all together. 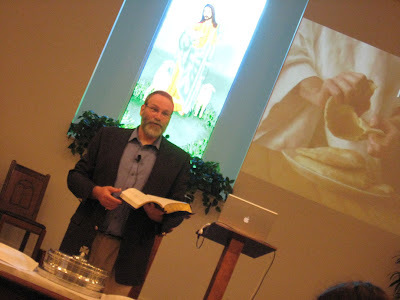 I was recently in a non-denominational church where they were doing a series on Daniel. It was so funny (strange/sad, not ha ha) to see how the speaker began reading from the Bible. Then, as he began to explain each verse, (more and more at length as the interpretation diverged more and more from what the verses where saying) he eventually left-off the reading all together and more than 30-minute was without any further reference to Scripture. And, this was a special conference on prophecy! As I was mingling after the event, I asked a friend of mine who is a member of that church if she noticed that the pastor never returned to the Bible after the first 15-minutes or less. She responded that she never even noticed. (That my friend is where the problem comes in.) I would so like to see a class, teaching folks some of the basics, in terms of typical methods of deception: i.e. “bait-and-switch,” “misdirection,” “mantras,” “commanded-ignorance,” and other such brain-washing techniques that are so prevalent in churches today. I've been SDA since 1973 and what I've learned is that the 10 commandments have a two-fold purpose; first, they give us standards by which to live by that will allow us to live life on earth that is unoffensive, productive, loving and uplifting towards our fellow man. Trying to keep the 10 perfectly IS impossible but it brings about the commandments' second purpose -- that is: TO LEAD US TO CHRIST, our Savior. God gave us two ways to obtain eternal life; keep the commandments perfectly, from birth till death, OR (once you see the impossibility of that) accept Jesus, the ONE who WAS able to keep the commandments perfectly from birth till death. He "gives" us eternal life but at the same time anyone will live a much more fulfilling life, here on earth, by keeping ALL the commandments to the best of their ability. Eternal life is a "gift" so that NO one can boast or compare their ability; that they may be keeping the commandments better than another, in such a way that they might assume their keeping of the commandments somehow makes them MORE deserving of eternal life. KEEP the commandments by all means, but NEVER-EVER think that your keeping of those commandments makes you MORE deserving than another of eternal life! Sorry to repeat myself but, really, some don't get it! Eternal life is a "GIFT" that when accepted is YOURS! And, just like any other gift, you don't have to go about day to day, week to week, month to month, etc. wondering if you'll have to give it back! We all must understand the FINALITY of that gift. I pray God will bless you all in your endeavor to seek out truth. Praise God and His unconditional love for us. Jesus says for us to abide in Him (Jn. 15). That word “abide” means to rest. We don’t just rest or abide in Him on the Sabbath, we are invited to abide (rest) in Jesus 7 days a week. We enter His rest each day as we die to our selves and allow Christ to live in us. (Gal. 2:20). When we sin, we break that rest in Him. When we sin, we break the Sabbath, no matter what day we sin on. But thank Him, we are not cast off, we can reenter that rest as we seek His forgiveness. We rest (abide) the first six days of the week in Jesus. On the Sabbath Day we come together to celebrate that rest. We celebrate that rest by giving Him thanks for what He has done for us before His incarnation and in His birth, life, death, resurrection, (all past tense) and for what He’s doing for us right now. We worship Him, not for fear of punishment or hope of reward, but because we love Him for what He’s already done for us. That rest is not a passive rest. If we are truly resting in Him, the fruit of the Holy Spirit will be evident in our lives as we walk with Him. If we are not experiencing the fruit of the Holy Spirit, then we should examine ourselves in the light of His word. Pray and ask God to guide you into repentance. If you are truly seeking His will for your life you will not be disappointed. Chris, thanks you for your accurate and encouraging report about the Seventh-day Adventists, some of our beliefs and our worship service. I am currently studying for the ministry at the SDA Theological Seminary on the campus of Andrews University in Berrien Springs MI. I find your writing very tasteful and honest. I would like to extend an invitation to you to come and visit us here at the Seminary and I will show you around. In the library, we also have the Center for Adventist Research where you can find most if not all the writings and theological studies that have come out of Adventism. You might find that interesting. So If you would like to come and visit us, we can also give you a flavor of a few different worship styles that we as Adventists take part in. Andrews University is the home of Pioneer Memorial Church, one of the larger and front running churches in our denomination. Our pastor there is Dwight K. Nelson. You may have heard of him. Anyway, you are welcome anytime and May the Lord bless you and keep you, may the Lord make his face to shine upon you and give you peace. It was so pleasing to read your report. I come from a Hindue backgound, tried few Churtches and eventually Holy Spirit lead me to SDA Church. No looking back since then. Its a blessing to worship The Lord of sabbath - Jesus Christ on Sabbath day and not termed Saturday. I like that point. May God bless you and reveal Himself to you in a mighty mighty way. as your continue to search for the Lord, may your life be filled with happiness, peace and joy which comes from Him. Hallelujah! Thank you so much for writing this, I was very encouraged by a number of things you found in the people of this church. I wanted to let you know, in case you didn't already about the film, "The Adventists," a one-hour documentary film on Seventh-day Adventists and their unique approach to health and healing. It will be shown on PBS stations in April.. Visit www.pbs.org or www.journeyfilms.com to find out viewing days and times in your area. To find out more about the film, visit www.theadventiststhefilm.com. My experience as a non-SDA is exactly as the described in this article; How refreshing to be so consistent. The Sabbath is a power scripture when used in concert with other scriptures of Prophecy regarding time as God defined it. What is revealed by remembering the Sabbath day is illustrated at this link I would like to share with this group. Chris.... You are a class act star journalist to write a truly objective article such as this. It is written truthfully without bias. You are to be commended. I hope God led you to visit our church... I had been raised in a prominent protestant church which taught the bible was the Word of God. However, the bible teachings were not taught in enough depth to satisfy my hunger for knowledge of God. When I was in my 20's I had many questions and began searching for answers from various communities of faith who would uphold the bible as the foundation of Christian teachings. When I was 32, I finally came across Seventh Day Adventists and found their indepth study of the bible to be the most refreshing source of inspiration I had ever come across in my search for God. I was immersed in the waters of baptism into Jesus Christ within the church of Seventh Day Adventists, and after 30 years still praise The Lord for having guided me into this church. Members are not perfect, but Jesus is perfect. We must all look to HIM. When we give ourselves as totally to Jesus as we are able at any moment, HIS Holy Spirit will guide us into all truth. The bible is also inspired by HIS Holy Spirit, and together with the guidance Holy Spirit as we ask of God, we grow year by year in knowledge and faith. God blesses those who seek for HIM with all their heart. God bless you, Chris, as you are guided by God in this life unto eternal life. I hope to meet you in eternity! What a wonderful hope we have as a Christian in Jesus!! Wow - that was a great article. It's cool that you would be so open-minded. Thanks for sharing. This article explained very well and without favoritism ... "all good things come from God." I cannot ignore, but to say that it was truly God inspired. Sabbath for us SDA's, is just more that a day to celebrate with friends and family, more that a good, emotional day of worship. If people could understand how Special Sabbath is, many would believe in the true living God. is a peace within, to know that on this very day, God rejoices with his people around the universe, imparting comfort, hope, peace, assurance, security, courage, help, forgiveness, straight, power to endure evil, desire to to good, love, and the list just keeps going on, and on. The Bible never speaks of such a special day to have been change by Jesus or the disciples. Why then we do not question this fact, why we just assume sunday is the day we show worship.? Is it because of tradition? why is it sunday so sacred for pagan religions? Sabbath have been ignored and rejected by so many religious leaders, but why is it that they cannot prove with a single Bible verse where is it that Jesus, or his disciples talk about changing the day of the lord? wasn't worship the cause of the argument of lucifer for his rebellion against Gods law of love? wouldn't it satan find a way to distract people from accepting any blessing that comes from God? Wouldn't it make you question? If the Bible tell us that the seventh day of the week is the sabbath day, the same days of creation, same day Adan and Eve meet God for the first time before they sin ( disobey) against God in the Garden of Eden. How is the Sabbath day, only for the Jews? So, if the the Sabbath is for the Son of Man( Jesus) consecrated to him, for the nations and the universe to worship Him for all eternity. ****Then, who is the lord of Sun-day? if not for the ancient Sun god,*** The ancient serpent . The enemy of God. And you may ask, why do we insist so stubbornly to let people know about this day?.. is a matter of obedience and loyalty. It Is because we desire all to know how wonderful it is to know you are special, that God himself separated a day to be with you and make peace with Him. Not other day was separated for God to be with his people, and when I say his people I don't refer to just adventist, we are all his, bought by his blood, we belong to him. But it is our individual choice to obey and follow. What are you waiting for.... let us show you how he has change our lives, and see what he is willing to do for you if you only obey his commandments of love. I would like to add a point to the thread and its discussion concerning the issue of Sabbath observance as defined by the Bible. In theological circles, there are two major classes of information concerning God. The first comes from looking at what He has made, and might be called "natural theology". The second comes from looking at what He has revealed, and falls into the area of "revealed theology". In a world suffering from the effects of sin, nature alone is a "bent mirror" that can give us some information about God--His power, His intelligence, His love of beauty, etc--but not other needed information, such as the details of His law, the coming of the Messiah, the advanced information that the Messiah's life would involve being born of a virgin, being born in Bethlehem of David's lineage, being crucified, being raised from the dead, and returning to planet Earth in the end to set all things right. Those sorts of things had to be told to us directly by God through His prophets, as they were not observable in the creation directly. Now here's the reason I believe the Sabbath is even more crucial and foundational than even Seventh-day Adventists make it out to be: It is original "revealed theology", the very first thing Adam and Eve were told that they couldn't see from looking at the newely created world around them. God made the world they lived in, then He gave them the Sabbath as a reminder that He wasn't a part of creation, but the Creator of it, and of them. Before the Bible itself was ever written, or sin had entered, the Sabbath was the Great Artist's way of signing His name to his work. That signature was not a part of the painting, but pointed to Him who was the Painter, so to speak. I repeat again: The seventh day Saturday Sabbath of the Bible is the very foundation of all later "revealed theology" that appears in Scripture--as it is of the same class of information about God, and as it predates the writing of Scripture itself. No wonder those opposed to Bible religion have taken such pains over the course of so many centuries to alter this seminal pillar of God's revelation. If it can be eliminated, replace, or forgotten, all subsequent revelation can be as easily discarded. thanks for the article chris! a friend shared it with me. makes me wanna visit that church. This is Ging a Third Generation S.D.A. Its so amazing to read such article about S.D.A from non S.D.A. Thank you for visiting one of our church service. You are welcome anytime anywhere. :) We are suppose to be a caring church to uplift one another to never give up caring and praying for any friends or strangers. We are supposed to be the people who respect anyone, and look at them the way God look at them. And we are supposed to be the people of the Book who strongly encourage everyone to read and study not to depend of what the preacher or other may say. We are supposed to be the people of the past ,present and future. I mean we study past, the future and present. We believe in justification, Sanctification and glorification. We are suppose to be the Biblical Base Christian who followed the conviction of the Holy Spirit not from the pressure of someone or the conviction of other people. Member are encourage not to be overbearing with one another but understand the different level of each persons level of understand and convictions. We are the people who strive to develop, Spiritual health, Physical, Mental and Social. 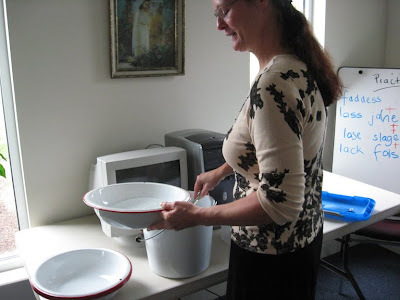 WE practice the Ordinance of Foot washing Because God said so; Its representing to serve one another and a symbol of humility. Once again, thank your for your visit and share about this High day of service in the S.D.A church. Chris, You have managed to achieve what few have; including Seventh-day Adventists. Through your writing (reporting) you have distilled the essence of Seventh-day Adventism in as fair and unaffected a way as I can recall ever having seen. Your approach is "real" and your genuine admiration of the people among whom you worshiped for the genuineness of their faith experience is very, very evident. You also appear to have taken the time to carefully familiarize yourself with the beliefs of Seventh-day Adventists and have highlighted some of the tenets of their faith with great precision and fairness. May you continue to be blessed in your own faith journey as you pursue the "path of the just." Incidentally, I am a Seventh-day Adventist, but I believe that you did such a superb job in presenting us fairly to the world, from a non-Adventist perspective that I would have found your blog admirable even if I wasn't an Adventist. I am blessed by this blog and I will be sharing it with friends. I am glad you had a good experience and I also hope that we (SDA's) will strive to make what you experienced a reality in their lives and in their churches. God bless you and keep striving to follow his will completely. On reading your review, I rejoice that the Holy Spirit has and continues to impress hearts in His own way. May God bless you as you continue to search for Him. We are here in Guam. We are moved to see how the Lord is working in sharing His word especially through media - like yours. We are able to love just because He first loved us! May God's name be praised forever. ADVENT = Coming of Jesus. ADVENTIST = A person awaiting the Second Coming of Jesus. SEVENTH-DAY ADVENTIST = A person awaiting the Second Coming of Jesus and keeps the Sabbath Holy for Jesus. Chris, thank you so much for your fair & unbiased report on the SDA. A Seventh-day Adventist couldn't have done a better job. I am a 1st generation SDA, but have searched for many years before God led me here. I have been an Adventist since 1989, & have no doubt that God has led me to where I am. If you ever make it to San Antonio, come on just a little further to Kerrville & visit us at the SDA church here. We would love to have you come, & you would be very welcome. We also have potluck every Sabbath after church, except when we have communion & foot-washing, at which time, members are encouraged to invite someone to their home for dinner. May God continue to lead you in your search for the truth. God Bless. thus, Sabbath actually means "the sign (or seal) of the eternal Father"
As for the "New Covenant"...It is to be written on our hearts. Jesus came to this earth to live and 'personalize', if you please, the laws of God. As it was mentioned before, the 10 Commandments were written in stone. They were verbally given, written the first time in stone, then written again after the tablets were broken. If there was no need for them, why did He write them again...He knew their importance. Christ communicated directly with Adam and Eve...which was the original plan. The laws of God were established at Creation, but when Jesus came to live and die for us, He took the time to share with the people...to draw the hearts of ALL to Him. To reconnect, as it were. As for the New Covenant needing something "New"...not at all. "For I am the Lord, I change not" Malachi 3:6 see also James 1:17. There was absolutely no reason to have "new" content. God is perfect, and it was perfect the way it was originally stated. Thank you very much, Chris, for your report on Sabbath worship. It is very easy, in any organized religion, for one to get caught up in the minutiae of programs or in the drama of other church members, and to forget about the purpose of worship as a congregation. I believe it is a tool that Satan uses; that forgetfulness. Thanks for your reminder! One of the best articles I read about Seventh-day Adventists and written by a non-Adventist writer. It's Sabbath now in Maryland and I cannot help but appreciate this wonderful write-up that will inspire every heart. Thank you so much Chris. It was written sometime ago and yet it continue to ring in my heart. Blessings! I stumbled on this article while googling for an Adventist Book Center in my vicinity. This article has really encouraged me in my SDA beliefs. I thank God for this article and for leading me to it. Hallelujah! Chris, I was raised SDA and while I'm currently on an 'off' section of my life, I still pull very much toward it, especially in times of trouble. I'm a young military wife, so finding a church that I feel comfortable getting used to isn't something that I've put thought into, until your blog, so thank you so much. To everyone else who commented, I'm so encouraged to see that there are so many of us, I have been shut off from so many people for a while and I'm looking into finding a church around our current base. Kristi- May God continue to bless you and help you find a vibrant Adventist group that is accessible to where you are. The closer we get to the return of Jesus the more we need to be with other believers to encourage each other. Hebrews 10:25. You can find all Seventh-day Adventist churches in North America using the search box on www.eadventist.net or Google Maps. If you are ever in the DFW area we welcome you to visit us at Richardson Seventh-day Adventist Church (www.RichardsonSDAChurch.org). I was forwarded this article by very close friends of my husband and I. We were baptized in 1975 as SDA's but in 1985 left this wonderful church for 18 years. We have been everywhere visiting other churches. They just didn't "cut it!" We came back in 2002 and we love worshiping God and our Saviour, Jesus Christ, with our fellow SDA's. Your article was wonderful and pointed out that worship, especially on the true and commanded Sabbath was such a huge blessing. And, yes, we DO NOT worship EG White. We worship Jesus wholeheartly and revere His Sabbath given at creation. Thank you for an honest and truthful article. As a former news reporter you have reported the facts. You are truly a gifted writer. Chris, It is amazing that an outside observer has such clarity to see through general misconceptions. As an SDA for over 29 years, I can truly say that Jesus gets us through life like nothing else can and that He is returning again soon. God Bless You on your journey. Thank you so much for your article. If you're ever in SoCal, come visit the La Sierra University SDA Church. We have a more traditional service at 9:30 and Church@Noon, geared for university students and the younger-at-heart. We live visitors. Greetings from Down Under. I was impressed by your review. People who know nothing about us have called us everything from "cult" to "religious fanatics". What set apart your review was the fact that you have actually experienced it and entered with an open mind. We are just sinful people who long for the truth and strive to live according to the Bible and God's will like our other Christian brothers and sisters. Jesus died for the sins of the world, that includes everyone. The question is do you believe it. If you truly invite Jesus into your heart and allow Him to direct your path He will do all the striving. Matthew 11:28 says "come to me all you who are heavy laden and I will give you rest". John 15:5 says "we can do nothing without Him". No matter how hard we strive to do otherwise we are lost sinners. It may sound like cheap grace but it's not, it cost the Son of God His life. If you ask Him to give you a heart appreciation for what He's done for you in eternity and on the cross, He will. That will be your true motivation. All other striving is a works or self righteousness. He knocks on the door of you heart constantly. Open up and you will then have a clearer view of the road you should be on. Thanks for your uplifting and inspiring article. Am not an SDA member but I've been there to attend their church service every Saturday for over two years, yes for me their church or doctrine is really different from others , the way they delivered the Holy Bible during their "Sabbath School" and they are very kind, nice and forgiving people. God bless. Thank you for your wonderful article! I have been raised Adventist all my life, married an Adventist and now we are expecting our 1st child who will also be raised Adventist. It was wonderful to read about your positive experience in going to one of our churches. May God continue to bless you in your writing! I see you have 176 comments on this post!!! I'm curious, is this your record or have you had more comments on other posts?? Anyway, excellent article. I saw it a couple years ago and then another friend just sent it to me again! ;-)))) I'm thankful to be part of this movement of faith, keeping the 7th-day Sabbath Holy and preparing for the soon coming of our Lord!! Thanks Chris for letting the world know that we are not a cult,we do not worship Ellen White and our teachings and beliefs are bible based. The Sabbath is for ALL MANKIND, SDA and all others. Those who are of other religions should give it a try. Start in your home by putting away the worldly desires and spend sunset Friday to sunset Saturday in communion with God through prayer,worship and Bible study . In the evening fellowship and socialize with family and friends over a good potluck (prepared the day before), listen to good christian music,play bible game ,have a bible quiz or take a nature walk. It's also OK to take a short nap. As the sun set offer up your thanks and praises. You will be rejuvinated and energized for your other day of worship and also the rest of the week. Soon you will be looking foward to the Sabbath rest. Thanks for writing this Chris. It's nice to read an article on Adventists that doesn't portray us as crazy people who weirdly go to church on Saturday. Much appreciated and God bless you! I appreciate your article so much! I am a lifelong Adventist and am appreciative of the nice review. It is so discouraging when false accusations about iur church are spread. We do not worship EGW but we do appreciate her pointing us to Christ. And what a nice distinction your blog post made about Sabbath being not just a worship service but an observance. Thanks! I'd like to follow your blog and invite you to follow mine. Thank you SO much for writing this article! It's so encouraging to see an unbiased, positive review of an SDA church by a non-SDA...there's not a lot of those out there these days. You are always welcome at our church in Downers Grove, IL, we'd love to have you visit if you're ever in town! (And yes that includes a potluck invitation as well:)) And that goes for any other non-SDAs reading through this now also! I love reading these comments and seeing everyone's stories and testimonies. God is so good! May He bless you. I grew up in the SDA church. I've seen it from the inside all my life, I've been educated by it, and I've spent years coming to terms with what that actually means in my life. This article is really fascinating to me because it shows how good the church is at masking to the world what it really is like. They've dressed themselves in a fleece so that the world will not recognize them for who they are. You said that the Adventist church does NOT worship Ellen White, but what you didn't mention is that most of their doctrines contain non-biblical or extra-biblical ideas that cannot be proven from Scripture, and that the doctrine of the Investigative Judgment, or the pre-advent judgment, is entirely non-biblical and contrary to what the Bible teaches about salvation and grace. The doctrine teaches that we must keep the law in order to EARN our salvation, and Paul did not take this idea lightly when he said if you do you have fallen from grace. Many adventist theologians have attempted to prove the IJ from Scripture, but none have succeeded. All of this (these extra-biblical ideas) come from Ellen White and her re-interpretation of William Miller's failed prophecy; where she has differed with the Bible they have opted to rely on her rather than God. They view her as a "continuing and authority source of truth", and from my own experience this means she trumps the Bible wherever they need her to in order to prove that they are right. What this means in the personal life of the adventist is that you are faced with truckloads of condemnation and fear. You're scared that you won't measure up, that you won't be saved, that you're going to do something wrong and be rejected by God. Adventism teaches that you have to keep the seventh-day as the sabbath and if you don't you will receive the Mark of the Beast. Sunday worshipers are, to them, Babylon. The prospects are terrifying! And the church has used this fear to scare people into accepting its message. But as Dianne said, our Sabbath is in Jesus, not a day. This is what the Bible teaches. The day was only a symbol, a shadow, of the real thing. And there is soo much freedom in seeing that! All the fear ("perfect love casts out fear", the love of Jesus), all the condemnation ("there is now NO condemnation to those who are in Christ Jesus", all this manipulation that adventism uses to control its members vanishes in the light of the truth: that it's all about Jesus. It is true that there are some adventist and some adventist churches that are moving away from their historic roots (all the fear, all the judgmentalism), and from what you wrote it sounds to me like you were lucky enough to experience a fairly evangelical adventist church. But if you think that is how the denomination is as a whole . . . it's not. That's a sadly small and incomplete picture. The adventist church really is very cultic in their beliefs, though they have fought that accusation bitterly. Jesus Christ really is NOT their focus; their idolization of Ellen White, the seventh-day Sabbath, the Ten Commandments, and their health ideals have taken their attention away from Jesus and placed it on themselves. They've traded the gospel message, the good news about Jesus, for another gospel - and Paul says if ANYONE teaches another gospel, let them be accursed. The adventist church, at the word of their prophet, they have broken the first commandment in order to keep the fourth. I sincerely love the adventist people. I've grown up among them, I've known many of them my whole life and I know that they are good people. But they are sincerely confused and misguided people who cannot see the truth of the biblical gospel because they are blinded by Ellen White and her false gospel. It's not the people that are the problem: it's the system. And I pray every day that the Spirit of the Lord will move into the darkness and bring the light, and He has in my own life. I will not be lengthy in my comments. I was baptized in a Baptist church at the age of seven. I was rebaptized when I joined the Adventist Church (my choice; they would have accepted my previous baptism) at the age of twentysix. I learned every doctrine straight from the Bible. Ellen White's writings were never mentioned until the study on the Spirit of Prophecy. I believe all born again Christian Adventist are very secure in their salvation; please do not mistake a desire to please God by striving to live according to His Will as works / living in fear of judgement. Whither or not you or anyone else believes the Adventist message is incorrect does not make it so. It does sadden me that there are some who are falling away from the beautiful truths the SDA Church teaches just as we are about to experience the time of the end and Jesus' triumphant second coming! Watch Dough Batchelor or David Asscherick (to name only two) and please rethink your conclusions about the Remnant Church. They do not use Ellen White to prove any doctrine!!!! I do believe Mrs. White was sent to guide God's last-day church into the Kingdom. God Bless. While I understand where you are coming from I totally disagree. I have been SDA for over 20 years and am currently getting ready to graduate from the theology program at one of their universities. While there are ultra conservative SDA's who fit into the description you mentioned above they are the exceptions not the mainstream. The SDA church does not base any of its teachings on EGW. Not once in the last 3 years of theology school has any teacher appealed to Ellen White for anything and we are consistently taught to avoid doing so. Just about everything else you mentioned regarding legalism, perfectionism etc. is false. 1. The investigative judgement is compatible with righteousness by faith. Those who accept Jesus are judged on his record, not ours. 2. "The Sabbath is a shadow of what is to come." The Sabbath is a memorial. The Sabbath points back to our creator and was first observed by God, Adam and Eve in the Garden. Thanks for such a nice blog post. I really enjoyed reading it. Thank you for your article I really enjoyed it. I want to personally invite you to come by our church "CELEBRATION SDA CHURCH" in Celebration, Florida if you're ever down in Orlando. It will be an honor to share church with you. May God richly bless you. How sad to hear people like you. I grew up SDA and heard so much about Ellen White that one day I decided to put her against the bible. I have a question for you: "Have you fully read any of her books?" Most of the people who hate her have not read her books and most of the bible time prophets were also hated! I love Jesus, there is nobody else in whom I can be saved other than Jesus and the Sabbath is my special date with my very best friend Jesus. I'm married and I still go out with my husband on a date, and the Sabbath is my special date with HIM. And Chris, thank you so much for your wonderfully written article. Please come and join us at Celebration SDA Church at Celebration, Florida whenever you're around. May God bless you!!!! Being an Adventist does not guarantee our salvation rather it is through obedience of ALL God's commands through faith which produces our actions(work) and saved by the grace of God. Chris, thank you for this wonderful testimony about the Adventists. I believe the Holy Spirit was working in your life a you were writing this and He does continue to work in you. God bless you and may you heed His calling. I'm a SDA in Roatan, and my favorite day is the Sabbath I get to rest from all my work and to fellowship with other believers and to visit the sick and the poor, and do good to others, this is what loving Jesus is all about. preparing to meet him one day soon. God Bless you Chris. Sir Knight, God really wanted you to find this truth,so you would share His truth from His Word .Holy Bible ! I was an SDA for 54 years. I NEVER thought of leaving. And I didn't. But in some areas, (I'm not saying everywhere), you get ministers that are all too human and although in denial, have power issues, and are willing to lie and oust those that don't agree with the way they dictate. It has been nearly 5 years since I was officially ousted and 7 years since I was shunned. So I certainly understand other folks from religions now that get shunned. It is about the most devastating manuver you can do to the human heart. I am not alone as far as this pastor doing this. A whole family was kicked out recently. Sigh. I now look at SDAs like I do JW, FLDS, and other sects that others consider cults. This pastor has forbidden anyone he kicks out from even continuing to worship with the congregation. In fact, they had an evangelistic crusade this fall and even though it was not held in their church building but a public building, he lied and said I could not bring an elderly member and stay myself. I had to get an email from the sheriff, showing others who were helping him do his dirty work, that he was not telling the truth. But it doesn't seem to matter. They all seem to be brain washed and stay to themselves. This is so different than before he was pastor. It was such a loving church. Was I speaking out at their meetings and being disruptive. NO! Never did anything but greet people who I'd not seen for a long time. So my faith in denominational religion is pretty shaken. But I just can't see the world without a Savior. It's just that I see religion as being used too often to try to control others. Write a positive post about the SDA faith and be sure that SDAs all over the world will come and sing their gratitude! Haha, but we have good reason to, so much negative things have been written about our church. I love you all my brothers and sisters. I thank the Lord for the love He has shown me through you. I could not read all the comments above but I did very much like the comment made about not having the spirit in us to believe that one is only whole when they are Adventist. So many people out there believe, appreciate and practice the love of Christ just as much as we try to or even more. The only difference is that we have been blessed with the opportunity to worship with like-minded and like-spirited individuals and maybe they have not. We are all His children, born in sin and bought at the Cross, not at the church. "The church is in the Laodicean state. The presence of God is not in her midst" —1NL 99 (1898). Briefly stated, if I had to summarize my painful experience in the Seventh-day Adventist church, I could do it in a single line. To me SDA stands for Stasi Demon Agency. If I had to explain just a little bit further, then adding one key line by Chris Hedges comes to mind: "The Nazis broke bones; the Stasi broke souls." Wow! This is one of the most refreshing articles I have ever read. Growing up as a young adventist is not easy especially when 90% of my friends are non adventists and keep telling me my faith is weird. At times I honestly don't know what to say.